Space is full of interesting objects. We often think of stars and galaxies, but there are other kinds of distant objects that have been discovered over the past 250 years. In 1764 the French astronomer Charles Messier found a whole new class of objects. He was hunting for comets, and had started to create a list of things in the sky that might look a little like a comet, but which didn’t move. The list, now known as the Messier Objects, was originally intended to help him and others find comets by confirming which things viewed though telescopes weren’t actually comets. Nearly 250 years ago, he turned his telescope to the sky and found something he catalogued as the 27th object in his list. For some time the telescopes available showed objects like M27 as looking a bit like the distant, outer planets in our own solar system, and they picked up the general name “Planetary Nebulae.” Just what they were wasn’t explained for another century, when William Huggins was able to look at the light from one of these fuzzy, roundish objects. Through spectroscopy he realized that he wasn’t looking at light being reflected from an object like a planet, or light from a hot luminous object like a star, but light being generated by excited gasses. Planetary nebulae are now known to be the spectacular remnants of a star that is throwing off vast quantities of gas late in its life. Some of them appear to be shedding multiple shells of gas. In the case of Messier 27, also called the Dumbbell Nebula, researchers have estimated that the bright gas we can see with telescopes likely was emitted from a star in the centre of the object about 10,000 years ago. In early May 2013 I decided to try using the University of Iowa’s Rigel telescope at the Winer Observatory, southeast of Tucson, Arizona (http://www.winer.org/) to image M27. 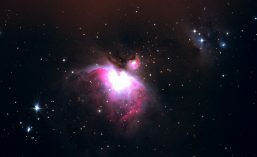 This telescope can be used by anyone over the Internet on the Sierra Stars Observatory Network (http://www.sierrastars.com), and I’ve been experimenting with it for the past few weeks. Messier 27, the Dumbbell Nebular, imaged with the 37 cm Rigel telescope owned by the University of Iowa, located in Arizona (the “Iowa Robotic Telescope Facility” or IRTF). The image was prepared from a series of monochrome pictures taken through colour filters (the “LRGB” process). combined with Fitswork4 and adjusted a bit with Adobe Photoshop Elements. The Dumbbell Nebula sits about 1,360 light years away from earth, and is about one light-year across. It’s also notable because of the star that remains at its centre: it’s the largest-known white dwarf star. 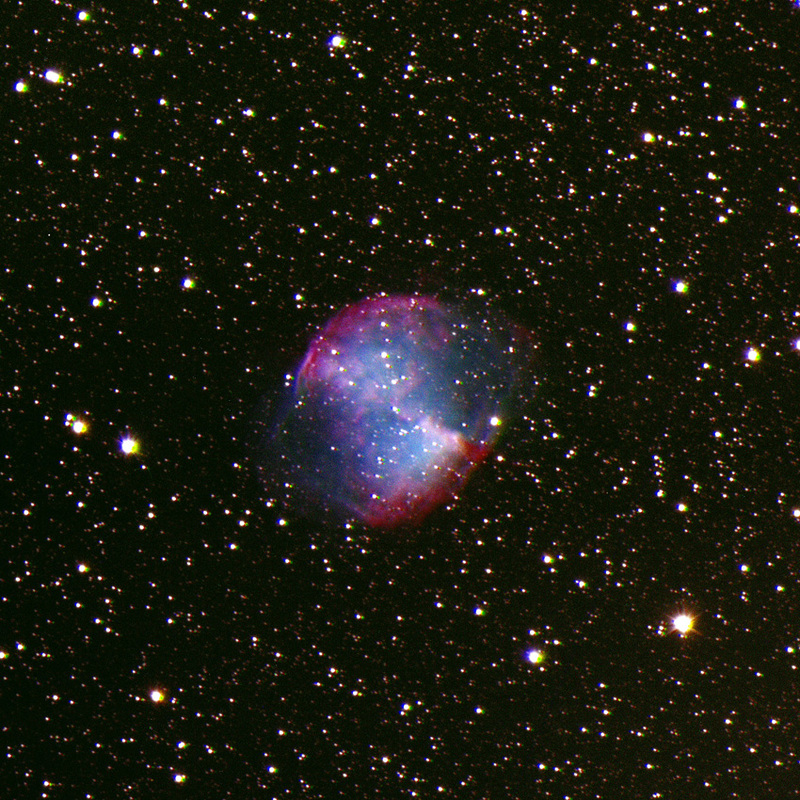 This first try at M27 is encouraging, but I wasn’t able to get good registration, or alignment, of the red, green, and blue frames. As a result the colours I was able to produce in the combined image are a bit off. If I can improve the registration process the image should be a bit better. I need to do some more work on my “workflow” to process image files once I have them. Our eyes see a composite image of the world around us. If your vision is “normal” the colours you see every day are composed of four type of information: brightness, plus red, yellow, and blue information, each coming into your brain from difference cells in your retinas. Colour images taken with large telescopes are assembled from the same four channels. Advanced cameras used in astrophotography are monochrome, or “black and white.” Colour comes into these images through combining multiple exposures, some done with red filters, blue filters, green filters, and some done with no colour filters at all. The result is an “LRGB” or Luminance-Red-Green-Blue image. I tried this process recently by using (again) the Sierra Stars Observatory’s 61 cm telescope in California, accessed over the internet on the Sierra Stars Observatory Network (see my posting from 21 April 2013 for monochrome results). Combining monochrome images with others taken with red, green, and blue filters, using software called fitswork, and the tuning things a little in Photoshop Elements, I was thrilled to see an attractive image of Messier 51, the Whirlpool Galaxy, materialize! Might be a bit heavy on the blue channel, but the arms of M51a are known for regions of hot, young stars, and its companion, M51b, is redder because of a higher number of older, redder stars. 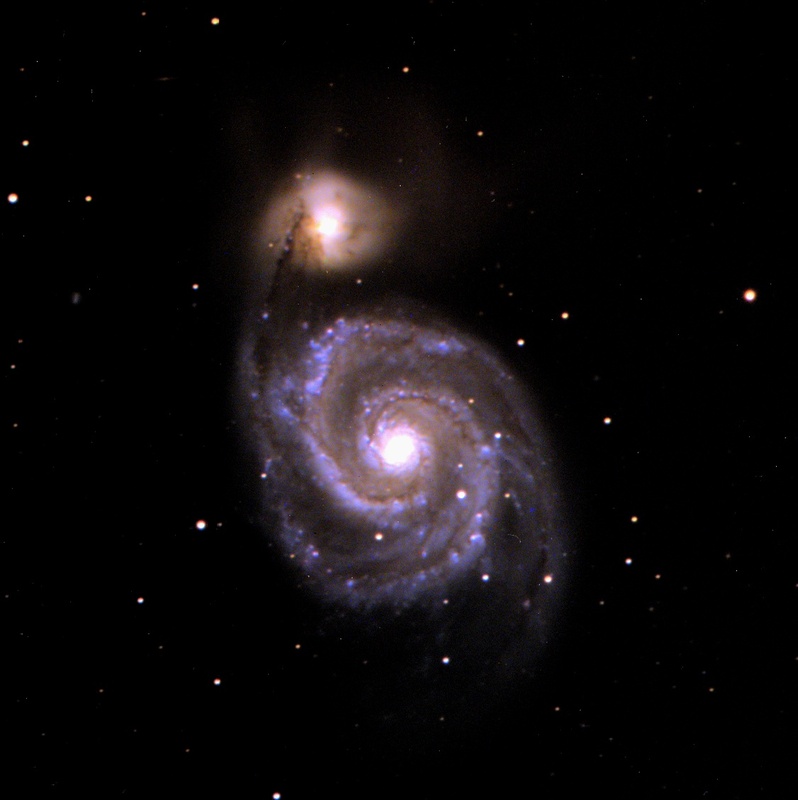 Messier 51, the Whirlpool Galaxy in Ursa Major, imaged using the 61 cm Sierra Stars Observatory in California. A composite colour image prepared by using monochrome images captured on 20 April 2013 and additional exposures for red, green, and blue information on 22 April 2013.